If you’ve ever attended a college fair, you know the drill: tons of colleges and universities set up tables or booths and display all kinds of brochures, hand-outs, and information for students to browse. Students typically walk around, pick up pieces, and maybe chat with a counselor or two. 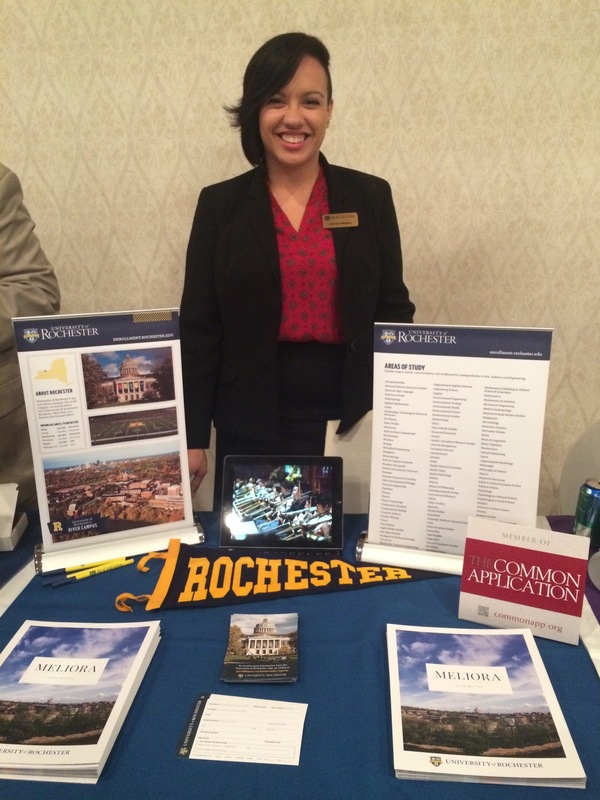 So, you might be wondering how you could possibly approach college fairs any differently. Well, after hearing hundreds of questions asked hundreds of times, I have some tips I’d love to share so that both you and the admissions counselors you’re talking with can get the most out of your exchange. 1. Don’t hit and run! Making a speedy dash through a college fair and picking up brochures at every table without stopping to talk to human beings or absorb any information is a waste of your time. You could have Googled a lot of what you just picked up. Plus, now you have a ton of information to sort through and make sense of, and some of it might not even pertain to your interests. Instead, make the most of the time you took to come to the fair, and actually stop and learn something about each college or university that interests you. You might discover some offering you had no idea a particular college has. The best way to make the most of your time at a college fair is to talk to counselors. And make sure you talk to a lot of them! It pains my heart when I hear a student asking the counselor at the next table all these questions about offerings they’re looking for, and that college doesn’t offer any of them. It’s not good form for me to step in and say, “We do!” so I have to wait for you to come chat with me. Don’t skip a table that looks interesting, especially if no one’s talking to the counselor! And don’t assume a school won’t have what you’re looking for. Walk up and make a new friend. You might just be surprised at the great fit. Don’t bother asking questions like, “What are your GPA and testing requirements?” These simple questions have easy answers you’ll find on the info packet you’re about to grab. Think about why you’re asking these questions. If you want to know specific admissions requirements, what you’re really trying to find out is if this school is a good fit for you academically and if you have a chance at getting in. So instead of, “What are your GPA and testing requirements,” think about asking, “How do you value GPA and test scores when making admissions decisions?” or, “What qualities are you looking for in a student?” or, “How heavily weighted is the SAT?” Your counselor can then give you a more specific answer and better context. And who knows? You may even realize that that university values other things more than numbers, and that you’ve got a lot more going for you than you realized. On the other hand, avoid vague questions like, “How is your biology program?” because it may be difficult for the counselor to answer and give you the context you need. Plus, in the case of the quality of certain programs, keep in mind: no school is going to tell you an academic program of theirs is bad! Instead, consider asking, “How is your biology program different from other schools’ programs?” By phrasing it this way, it lets counselors talk about the program in a more targeted and substantial way than if we had to talk about the program in a vague, general sense. As you’re talking to counselors, don’t automatically grab every single piece of paper on their table. Ask the counselor if anything on the table relates to what you’re interested in. This not only saves you from having to carry five pounds of brochures, it allows you to have a more curated collection of information to sort through so you can do more focused research when you get home. So, to sum it all up, take your time, strike up conversations with lots of counselors, ask thoughtful questions, and be wise about what you take from tables. We love to talk about our school to help you find the best fit for you!